Specialization when it comes to successfully wagering on the NBA can prove to be a viable betting strategy over the long run. I have spent the entire NBA regular season concentrating my handicapping efforts on the Washington Wizards, and to help prove this point I have been releasing free weekly picks for the Wizards with the use of Doc's Sports Unit Betting System. The results have been mixed at best with a year-to-date record of 8-9-1, but I began to turn things around with a 4-Unit payoff in my last pick. Doc's has been posting these weekly free picks for Washington on its homepage, so be sure to check the site to follow along with my progress. The Wizards continue to fight for position in the Eastern Conference standings while I continue to work on bringing you winning picks for their games. The Wizards return home this Friday night to play host to the Miami Heat in a crucial matchup between these two Southeast Division rivals. Tipoff from the Verizon Center is set for 7 p.m. (ET), and the game will be available on NBA League Pass. The Heat come into Friday's matchup fresh off a 100-94 victory against the Los Angeles Lakers, but they could not cover as 9.5-point home favorites. They are now 6-4 SU in their last 10 games while going 4-5-1 ATS. The total has stayed "under" in three of their last five contests. Washington snapped a straight up six-game losing streak with last Saturday's 99-95 victory at home against Detroit, only to lose again this past Tuesday in a 97-92 setback to Chicago on the road. 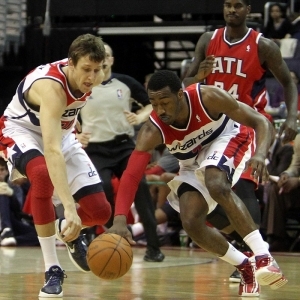 The Wizards failed to cover in either game, and they are now a dismal 3-16 against the spread in their last 19 games. The total has stayed under in seven of their last 11 outings. Miami is currently holding down the seventh spot in the Eastern Conference standings with a SU record of 27-33, and on the road this season it is 15-16 SU while going 16-14-1 ATS. Scoring has been an issue for the Heat all season long with an average of 94.1 points per game while shooting 45.5 percent from the field, but they have exceeded this average in four of their last six games. Defensively, they are allowing an average of 96.7 points on the other end of the court. The loss of Chris Bosh, due to an issue with his lungs, has not helped the cause. He was the team's leading scorer with 21.1 PPG, and in his absence the Heat will look to Dwyane Wade to help fill the void with 20.7 PPG when he is healthy. The addition of Goran Dragic at the NBA trade deadline has added a much-needed scoring punch, and in his first seven games with the Heat he is averaging 15.9 points and 4.9 assists. In Wednesday's matchup against the Lakers, Wade put up a game-high 25 points, and Dragic added 21 points and six assists to help pace the win. The Wizards have been on a downward spiral since late January with a SU record of 3-12 in their last 15 games while failing to cover in their last seven outings. This slide has dropped them to fifth in the East at 34-27. They are still 21-10 SU at home this season with a costly 13-18 record ATS. Washington is another team that ranks in the bottom third of the league in scoring with 98.6 PPG, but it remains the 10th-best team in points allowed (98.0). It is also ranked 10th in rebounds with 44 a game and fifth in the league in assists (24.2). Kris Humphries is currently listed as 'doubtful' for Friday night with a hamstring injury, but the Wizards received a huge boost in its lineup with the return of Bradley Beal. He played 35 minutes in Tuesday's loss to the Bulls and scored 13 points while pulling down four rebounds. Along with John Wall (17.2 points and 10.1 assists), Washington has one of the top backcourts in the league when both these players are on the floor. BetOnline has opened the Wizards as four-point home favorites for Friday night's Southeast Division showdown, and the total for this matchup has been set at 194. The Heat are 1-4 ATS in their last five road games, and they are 1-6-1 ATS in their last eight games playing on one day's rest. The total has gone over in five of their last seven games on the road. The Wizards are 5-17-1 ATS in their last 23 games following a SU loss, and they are 2-6 ATS in their last eight home games. The total has stayed under in 11 of their last 16 games played at home. The home team in this division showdown has covered in the last six games, and the total has gone over in the last four games. Washington has won four of the last six games SU, including a tight 105-103 victory in late December as a six-point road favorite. Given both of these team's scoring trends and their ability to slow the pace of play through defense, this matchup benefits from a very favorable total line. I am extremely skeptical on Washington covering in this one, but the return of Beal to the lineup gives the Wizards another key scoring threat that they have been lacking in his absence. This sets the stage for a 3-Unit play on the "over" 194 for Friday night.